With the Rockets playing the same day as the Oscars were handed out, I was going to make a crack that compared Tracy McGrady’s salary drain on the Rockets with Slumdog Millionaire, but I won’t go there. Even with team executive Michael Jordan at Toyota Center, the Rockets blew out the 22-34 Charlotte Bobcats 99-78 Sunday afternoon to win their fourth in a row, avoiding suffering the lapses they encountered against sub-par teams so many times before the All-Star break. The Rockets are now 14 games over .500 for the first time all season at 35-21. I feel true momentum building here. Yao Ming only took 6 shots in the first half and made 3 of them. At first it didn’t look like the Rockets would need much of his scoring since they got off to a great start, shooting 55% in the first quarter and opening an 11-point lead in the first half. Yao Ming’s jumpers and hook shots Sunday afternoon. But then they hit a dry spell and the Bobcats whittled the lead down to 2 points by halftime, 44-42. That’s when you had to ask yourself if the Rockets were going to go back to their old ways and struggle against teams they should handily beat. I knew there was no way, though. This team is just too balanced to have that happen again after all the optimism from the past few days. But you never know. That’s why they play the games. It didn’t take long for them to finally make their statement. 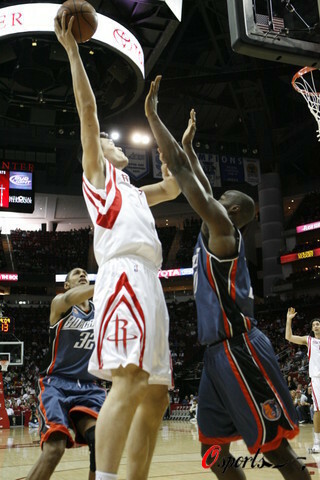 Yao Ming was more aggressive to start the 3rd quarter, scoring the first 6 points. He followed that up with a sweet no-look pass in the post over the head of his defender to Shane Battier for a reverse layup, which gave the Rockets a 54-46 lead. Yao later followed that up with a block of Gerald Wallace, who challenged him by taking it strong to the hole. The blocked ball led to a 3-pointer by Shane on the other end, extending the lead to 61-50. Then less than a minute later Yao threw a long pass from the post across the court to Battier again for his second triple in a row. After that, the Rockets cruised the rest of the way. Coach Rick Adelman explained their strategy in the third: “In the second half, we did a better job of moving the ball around and when he caught it they weren’t in a position to come at him as quickly and he was able to be aggressive and take it. In the first half we didn’t do that. We were kind of standing. Yao would finish with 19 points on 7-of-11 shots, 7 rebounds, 4 assists, and 2 blocked shots. The only things he did wrong happened in threes: 3 turnovers and 3 missed free throws in a row, with the latter being something you might not see until the next decade. He was only outshined by Ron Artest, who was on fire hitting 5-of-7 three pointers and finishing with 26 points on 9-of-15 shooting overall. He was carrying the load in the first by scoring 18 of the Rockets’ 44 points compared to Yao’s six. Whoever thought Artest should have been traded before the deadline last week was dead wrong. I knew he was being stunted by McGrady’s presence. And I’ll even say right now that the Rockets should do everything they can to sign him to a contract after this season. I just hope Slumdog’s salary doesn’t keep them from doing that. New starting point guard and Dallas game hero Aaron Brooks scored 7 points on 3-of-9 shots, and had 4 assists and only 1 turnover. Scoring from A.B. wasn’t needed because of the the Rockets’ defense, holding the Bobcats to 36% shooting overall. You also had always-reliable Luis Scola pouring in 12 points on 5-of-10 shots (and 10 boards) and Shane Battier scoring 12 on 4-of-7 shots. I’m really liking how Battier is making more of an impact in the scoring column now that McGrady is out of the picture. Funny what a ball-stopping poor-3-point-jacker-upper off the court will do to an offense. And after getting off to a slow start in the first half with 0-for-3 shooting overall and the 3-point line (including 2 airballs), Vonny “The Microwave” Wafer (how do you like that one?) started heating up and hit 3-of-4 three-pointers to finish with 13 points. By that time, the Rockets really didn’t need his points, but it was good to see him light it up because you know they’ll need that from him sometime down the line. This entry was posted on Monday, February 23rd, 2009 at 3:02 am	and is filed under vs. Charlotte. You can follow any responses to this entry through the RSS 2.0 feed. It may be a wishful thinking, but I hope the team is going to extend the winning streak to better last year's one. It's something to be thankful for that we're looking right with Portland and Cleveland coming up. Thank God it's at home. Well we just barely lost to Portland TrailBlazer on their home court on a 0.2 second 3-pointer prayer from Brandon Roy (which should not have stood cos the time clock was dried) ……and we're without Shane Battier in that game. And that loss to Cavaliers was just ridiculous, as Big Yao was unfairly adjudged by some very very dubious and biased officiating and was virtually taken out of the game. The referees seemed determined to protect the 100% home court record for the Cavaliers for that game. Personally think, with or without Tracy McGrady, the Rockets should be able to beat these 2 teams this time round. So it's revenge time !! !